A former Border Patrol agent accused of killing a man for allegedly having an affair with his wife has been indicted in the fatal shooting in Texas, the Associated Press reports. Adam Garibay was lodged in the Medina County Jail on Wednesday on charges of murder, assault and evading arrest. He is being held on a $3.1 million bond. Garibay quit his job as an agent after his Jan. 2 arrest. Garibay is accused of beating her wife to identify a man with whom she was having an affair. 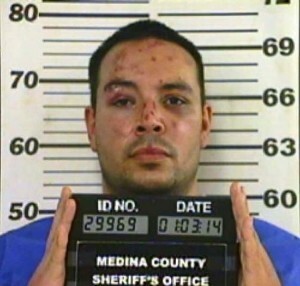 Garibay then drove 160 miles to shoot Keith Martin, prosecutors allege. Posted: 3/6/14 at 8:53 AM under News Story.